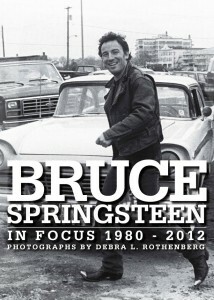 Bruce Springsteen fan or not, you’re bound to enjoy Bruce Springsteen In Focus 1980-2012 by Debra L. Rothenberg. Like me, Debra is from a north N.J. town, has a love for ‘The Boss’ bordering on the fanatical (lots of us Jersey people feel this way) and truly can boast seeing Bruce in concert…a lot! Debra though has photographed the shows, from her first in 1980, when Bruce came through Jersey during The River tour, up through Born In The U.S.A., The Rising (I’m jumping around a bit here) to smaller ‘surprise’ Springsteen appearances at Asbury Park’s Stone Pony, to catching ‘The Boss’ in Europe….even on a video shoot. Included between all these amazing pictures, mostly in-concert shots and mostly of the man himself, are essays from other Bruce fans, pro journalists, musicians etc. Of course we get Debra’s own thoughts too, not only about Bruce but on her life and how much she loves what she does. Bruce Springsteen In Focus 1980-2012 is as much Debra’s journey as it is a tapestry for music fans who grew up loving this rich live concert era of over 30 years, when Bruce made it so special to go out and see a show (and he still does actually.) Yes, I might be slightly biased here, seeing as I am a Springsteen fan, but I assure you this is as great a ‘read’ as it is a photo journalistic ‘essay.’ And let’s face it, the man looks great in too many of these shots to ignore!